180degree view of every ship that sails into Seattle. Enjoy privacy and luxury in your fabulous westside view getaway. Located just above the shipping lanes of Admiralty Inlet watch every ship that sails in and out of Seattle go by. As the sun sets behind the majestic snow capped Olympic Mountains and reflects onto the water the view will take your breath away. You can see all the way to Victoria, Canada. Your secluded hot tub is located on a 14' x 60' deck with an amazing view of ships & sunsets. Deck is equipped with lounge furniture & a gas BBQ. A fully stocked view kitchen makes cooking a pleasure. View kitchen, dining room, living room, master bed & bath. The wildlife is abundant, eagles, finches, quails, deer and dozens of bunnies! A perfect romantic retreat for 'two' (we close off the back of the home) or a comfortable getaway for a family vacation. walk to the beach where you can enjoy beachcombing and the best salmon fishing on the island. parks close by. For you bicycle enthusiasts we are located on the suggested bike route for touring Whidbey Island. We offer gift certificates, they make a great wedding gift, a birthday or Christmas gift. We purchased this home in 1987, we spent alot of time searching for the perfect getaway. Seattle is within an 1 1/2 hrs drive. We started renting it out as soon as we remodeled it and added a hot tub. Soon we were unable to stay on weekends because it was always full! The view of the ships, sunsets and the Olympics mezmerized us into wanting to live here full time. We did just that for 10 years and when our children fled the nest we built a new home behind it and turned our home into a vacation rental once again. We love the island and plan on retiring here some day. My husband, Thom, works at home as a steel detailer and I have been doing interior design since 1983. My work takes me to the city once or twice a week and I look forward to returning to Whidbey Island after a day of work. Our goal is to provide a perfect getaway for our vistors, we put every amenity for your relaxation and comfort. We purchased this property for it's location! We fell in love with the expansive view and the quiet road. We never get tired of seeing the magnificent sunsets or the ships sailing out to sea. We have the Best Sunsets on Whidbey. The property is located on a quiet dead end lane w/over 1/2 acre of grounds to enjoy. A fire pit and horseshoes are availble for your enjoyment. Private hot tub. Pet friendly. No deposit or cleaning fee! Fully stocked kitchen with every amenity. Whidbey's Island Coffee provided. This worked out wonderfully for our extended group for Thanksgiving. Beautiful view. Layout of house was perfect for our group. Very accommodating with the addition of a dog. Place was very clean but a bit worn, but our group was very happy with their accommodations. Our family of 7 plus dog Tasha dearly loved our stay. It was incredibly relaxing for all of us. The first night there we were greeted by a doe and her two fawns in the backyard. We were 5 minutes from the perfect place to kayak. Hiking through a State park was close by, too. Fran was so welcoming and made sure we had everything we needed. We dearly loved out stay here. Stunning panoramic views of the Puget Sound and sunset! Funny story. . . I was trying to book an Olympic Rainforest trip for the family and didn't notice this property is on Whidbey Island. So. . . We decided to make the best of it. Turned out we had a great time at the property and on the island. Deception Pass is gorgeous. We took a boat tour of the pass and saw harbor seals and porpoises. Langley is a cute little town not far from the house. We went a few times, one of which we got to go behind the scenes at Callahan's Firehouse to experience glassblowing. The property is big with horseshoes and a large grassy area. Our dog loved running around in the yard. We spent our sunsets relaxing in the jacuzzi with a panoramic view of the water. Peaceful, private, pretty. We saw deer, rabbits, and many species of birds. In four days, we had sun, wind, rain, and fog, sometimes all in one day. 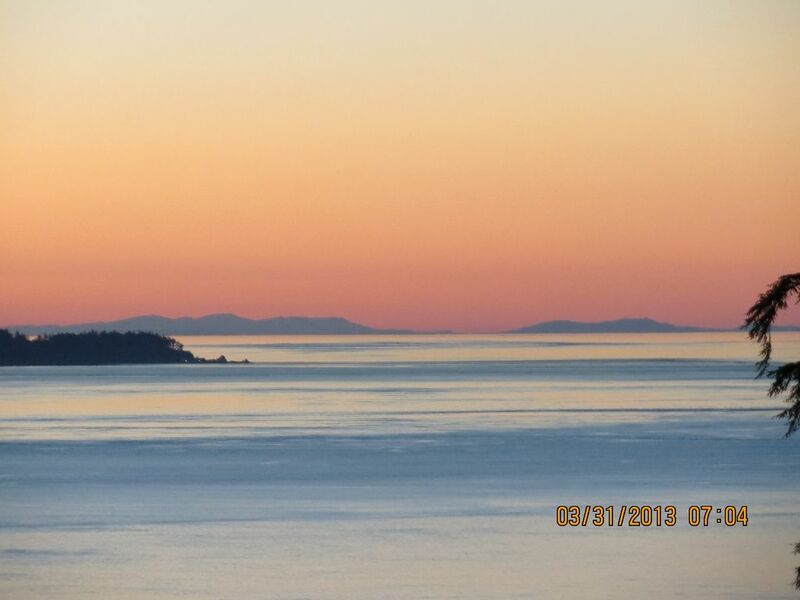 You can see the Olympic mountains to the southwest, all the way north to the San Juan Islands. It appears 2 single wide trailers were merged into one, a long time ago. Living area has windows across the front that provide a great view but made the entire area unbearably hot. When it was cold there was only one vent to provide heat for the entire area in the forward trailer. No air conditioning and only one fan above the dining table. ‘Master bedroom’ was in the forward trailer. The rear trailer has 1 bedroom with a door although there is a 3-4 inch gap at the top and bottom. Has 1 window that opens into a tree with no screen. There is a small bathroom next followed by an open area with a daybed. Next comes the other bed with a folding louvered door. Don’t expect any privacy unless you’re in the master, that is a little tight with the bathtub in the room. Ice maker didn’t work, with only 2 plastic ice cube trays. As far as the 10 minute walk to the ‘beach’, first you must walk back to the main road, then down to the next street, down that street, make a left past a few more homes and deserted buildings, to what appears to be a small boat launch, no beach. I called Fran in advance to ask about any particulars for the property and I was told everything would be in the binder in the kitchen. There we discovered washer and dryer could only be used if you stayed a week and dogs cannot be unattended. Fran, although nice, was over every day. Was not private at all. We checked in Thursday night and Saturday night while cleaning up after dinner we discovered a big leak under the sink. Fran, her daughter and 2 son-in-laws came over and said we couldn’t use the kitchen sink any longer. We said that we had to leave then, we could no longer cook and weren’t offered any compensation for the major inconvenience. We paid thru Sunday. Gave it 1 star for the view, hot tub worked and it was clean. Huge disappointment for celebrating my sons’ 40th birthday. Awesome view, private yard and surroundings, hot tub, gas grill, plenty of seating, games provided, well stocked kitchen. Host is very welcoming. WiFi is spotty. Coverage is bad & slow. They need to make this upgrade. The '5 minute walk' to beach is really 10-15 with all uphill coming back. Access for kayak or SUP would be difficult. We welcome pets at our getaway. Located close by are 4 off leash parks & beaches that allow dogs off leash too. Lots of hiking trails are in the vicinity for you and your dogs pleasure.